The thermometer says 24 degrees as the cold instantly stings my face through the opening of my balaclava. I coax my Suzuki V-Strom to life on this brisk December morning for a length-wide trip across my home state of North Carolina. As a schoolboy learning about North Carolina history, the phrase “Murphy to Manteo” always came up as we studied the Old North State’s three diverse regions — Mountains, Piedmont and Coastal Plain. I grew up exploring the mountains, but always felt a bit of embarrassment as a native North Carolinian that I’d never seen the Outer Banks — that I’d never actually traveled from Murphy to Manteo. I make quick work of the four-lane highway from my home near Asheville to the Tennessee border on U.S. 64/74. I don’t consider the journey officially under way until I see that road sign at the state line indicating Manteo, 563 miles — which it turns out totally inaccurate if you take the old road all the way. I’ve met a few other riders who boasted they’d made the trip, but all of them took the main highways, U.S. 74 and Interstate 40. I intend to make the journey on the old road, U.S. 64. I even plan to ride the abandoned sections and business routes as much as possible. Eastbound and down from the Volunteer State, I first stop at the last remaining “See Rock City” barn on the Tar Heel section of U.S. 64 a few miles west of Murphy. There will be no more of those icons of childhood family trips on the road ahead of me. I roll into downtown Murphy with a morning fog intensifying the quiet streets of this westernmost city, which lies closer to the state capitals of five other states than its own. U.S. 64 runs 2,326 miles from its western terminus near the Four Corners in Arizona to within yards of the Atlantic Ocean at Whalebone Junction in Nags Head. Like many famous old thoroughfares, interstate highways and four lanes often rob the U.S. routes of their local flavor. Here in North Carolina, the road escaped annexation into I-40 and remains the Main Street for many of the state’s small towns. In Murphy, the road splits from U.S. 74 at the Hiwassee River and returns to the scenic two-lane that inspired me to follow it all the way to the coast. The sun begins to warm the December air and soon I pass along the north shore of Chatuge Lake and its deep blue waters stretching to Georgia. Brasstown Bald rises in the distance and would be an excellent detour to explore with its views spanning the Smokey Mountains to the outskirts of Atlanta. About 15 miles east of Hayesville, turn to the left on an abandoned section of 64 that now serves as a scenic overlook. To the west lies a grand vista of the Smokey Mountains. As you enter Franklin, Wayah Road, another excellent motorcycle road, heads north to Nantahala Lake. But I press westward on U.S. 64 committed to my mission of Murphy to Manteo. I stop in Franklin just down the street from the ancient Indian mound to admire this edifice built by the Cherokee in the village of Nikwasi centuries before someone decided to build a tire shop and auto parts store next to it. Native American history buffs visiting this region should be sure to plan trips to Judaculla Rock near Cullowhee and Track Rock Gap in north Georgia. The 56-mile section of U.S. 64 from Franklin to Brevard is the most challenging, and most rewarding, for a motorcyclist. The road climbs up from Franklin through the Cullasaja Gorge along the cliff above the river, which cascades down a series of large and small waterfalls. In winter, the lack of leaves grants riders a better view of the gorge, but don’t take your eyes of the road for long because the narrow, winding highway can prove dangerous. There are numerous pull-offs if you wish to take in the scenery. Stop at Dry Falls where you can walk underneath the 75-foot waterfall. As you approach the town of Highlands, Bridal Veil Falls appears on your left. If the side road is open, you can actually drive under the falls. From Highlands, the road rides the crest of the Blue Ridge Escarpment and descends to Brevard, famous for its white squirrel population. I continue along U.S. 64 to Hendersonville, where I stop to admire the angel that inspired Asheville-born writer Thomas Wolfe to pen his masterpiece, “Look Homeward, Angel.” The headstone is clearly visible from U.S. 64 as you enter the town. With the sun setting, I backtrack to home for the night to get some rest for the 10-hour trek to the coast at dawn. The rising sun hurts my eyes as I snake my way down the Hickory Nut Gorge with the December chill already making my fingers numb. Towering to my right stands the prominent granite monolith, Chimney Rock, complimented by the neighboring icy-looking Hickory Nut Falls. In the summer, this section would be crowded with tourists all the way to Lake Lure. In winter, I had the road to myself. Past the lake, U.S. 64 settles into rolling hills as we near the Piedmont at Rutherfordton. The drop and elevation along with a climbing sun make the trip warmer, and I’m able to relax my vigilant watch for possible early morning black ice. While not as stunning visually as the mountain section, the ride across the foothills of the Piedmont flows by pleasantly even with the commuter traffic. Stopping in every small town along U.S. 64 is no way to make good time, but it enjoyable to stop for a rest break, read the historical markers in each town square and just contemplate the freedom of riding a motorcycle across the length of your home state. The road criss-crosses Interstate 40 several times before reaching Raleigh. This would only be about a 9 hour trip on the super-slab. Taking U.S. 64 the whole way —and seeing the real North Carolina — will take about 14 hours. Time well spent as I pause at the red lights in each small town trying to notice each one’s unique character. My grandmother was born in Siler City, a place I’ve heard about in my childhood but never seen. Seems like the perfect place for a rest break along Main Street. The relaxing country ride begins to dissolve as traffic increases approaching Cary and Raleigh. Previously, I took extra care to find the original route of U.S. 64, even taking small loops out and back to the current road. But it was getting late in the afternoon, cagers on cellphones constantly demanded my defensive riding skills. I decided to follow the modern route where 64 rides along the interstate loop around Raleigh. A small cheat from my plan, but with fatigue setting in, I figured it was the safer choice. I catch Business 64 on the eastside of town and set aside my guilt for taking the bypass. I stop for dinner in Rocky Mount and realize the final leg of my journey will be a section of U.S. 64 I’ve never traveled. I make a mental note to be more observant of the countryside since this would be my inaugural ride through these parts, a mountain boy cruising across the state’s Coastal Plain to his first visit to the Outer Banks. Darkness falls, and I’m still 90 miles from the coast. The long, straight road beckons. Traffic vanishes. I glance down at the Suzuki’s speedometer to notice I’m at license-revocation velocity. No taillights ahead. No headlights behind. Let it ride. As I cross the long bridge over the Alligator River, I notice lots of roadkill on the bridge. How did a opossum get a mile over water on this nearly three-mile long bridge? The next day I realized those were seagulls and I shuttered to think what would’ve happen had I taken one of those to the face shield at 80-plus mph. At Manns Harbor, I turn north along old 64 to the top of Roanoke Island. Before me appears a “Welcome to Manteo” sign. The catchphrase I learned as a kid was now accomplished atop a motorcycle. But this wasn’t the end. I still had a few miles left of my beloved U.S. 64. At a nondescript intersection with N.C. 12 in Nags Head at Whalebone Junction, U.S. 64 dissolves into U.S. 158. My quest ends in darkness at the eastern terminus. This being the offseason, the village is still and quiet. Not a soul witnesses my arrival as I smile to myself and reflect on the wonderful, yet tiring, journey across my native North Carolina. On the sandy shoulder, I kill the engine and remove my helmet. In the distance, I can hear the ocean. The next morning, I head off to see the famed sights of the Outer Banks. U.S. 64 ends not far from where the Wright Brothers took their first powered flight. At Kill Devil Hills. Scattered strategically along the Outer Banks are a series of beautiful lighthouses. 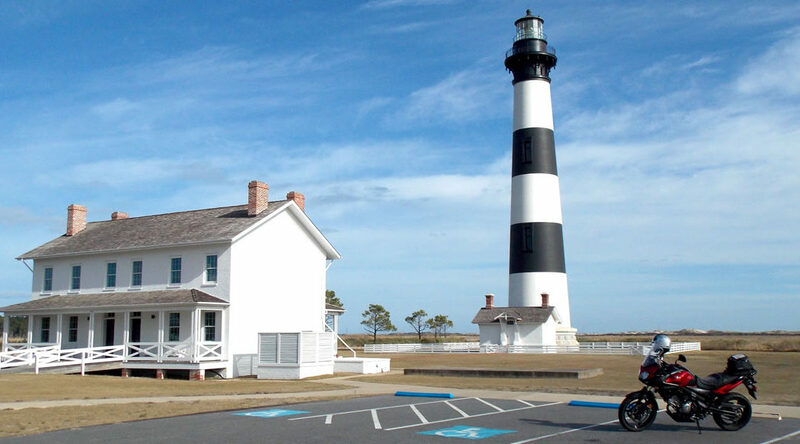 The image of the Cape Hatteras lighthouse is almost ever-present across the state, but I found the Bodie Island lighthouse to be my favorite and more picturesque. As the rode along the nearly deserted road through the Cape Hatteras National Seashore, I marveled at the nearly three-story sand dunes along the road. With no tourist traffic, houses or even trees, I felt like I was in a Mad Max movie crossing the desert wasteland until a small village appeared occasionally on the horizon. With no more monuments left on my must-see list, I pause for a picture at the eastern end of U.S. 64. One last glimpse toward the Atlantic, one last lungful of sea air, and I flip down the visor, click it gear and head ever westward toward my mountain home.